On a bright, shiny Tuesday in April, Boeing employees crowded office windows, the ramp, and the roof of Plant 2 in Seattle, Wash., to watch test pilots Alvin M. “Tex” Johnston and Lt. Col. Guy M. Townsend take to the air in a silvery new flying machine. At 11:03 a.m. on April 15, 1952, the YB-52 – the second plane in the series to be built but first to fly – left the ground and left behind the unique black smoke trails associated with its J57 turbojet engines. Sixty years later, now the longest-serving warplane in history, the B-52 Stratofortress is known to crews as the Buff, for “Big Fat Ugly Fellow.” At least that’s what they call it when they’re being polite. Designed for trans-polar atomic warfare with the Soviet Union, the B-52 has both nuclear and conventional duties today. The Buff continues to have a major role while a much-reorganized U.S. Air Force confronts budget cuts and strategic uncertainties. The Air Force’s nuclear mission today is the responsibility of Global Strike Command, headquartered at Barksdale Air Force Base (AFB), La. Design and developmental work on the B-52 began in the 1940s and two prototypes, an XB-52 and YB-52, were built in great secrecy. (The “X” means experimental and the “Y” denotes a service-test aircraft, although the two airframes were identical.) By the time the YB-52 flew at Seattle on April 15, 1952, it resembled a B-47 Stratojet on steroids, with its 35-degree swept wing, podded engines, and “bicycle” undercarriage. The new bomber’s fuel capacity was greater than in any previous production aircraft at 38,865 U.S. gallons with drop tanks. Powerplants were eight Pratt & Whitney YJ57-P-3 axial-flow turbojets, delivering 8,700 pounds of thrust each and podded in pairs on four under-wing pylons. Water injection for boosted power on takeoff gave these engines their distinctive black trail of smoke and fumes. The gigantic fin, with only its trailing edge hinged to form a rudder, made the bomber’s height 48 feet, 3 and 2/3 inches, and could be folded to permit the bomber to enter standard hangars. The B-52 did not rotate on takeoff but, rather, popped aloft, its wing set at an incidence of 8 degrees for a flyaway with the fuselage horizontal. On landing, the B-52 employed a 44-foot braking parachute, stowed in a compartment in the rear fuselage. The B-52 changed little during its 10-year production run. Three B-52As were followed by 23 B-52Bs. B-52Bs entered service with the Strategic Air Command’s 93rd Bombardment Wing at Castle AFB, Calif., on June 29, 1955. Twenty-seven RB-52Bs came next. 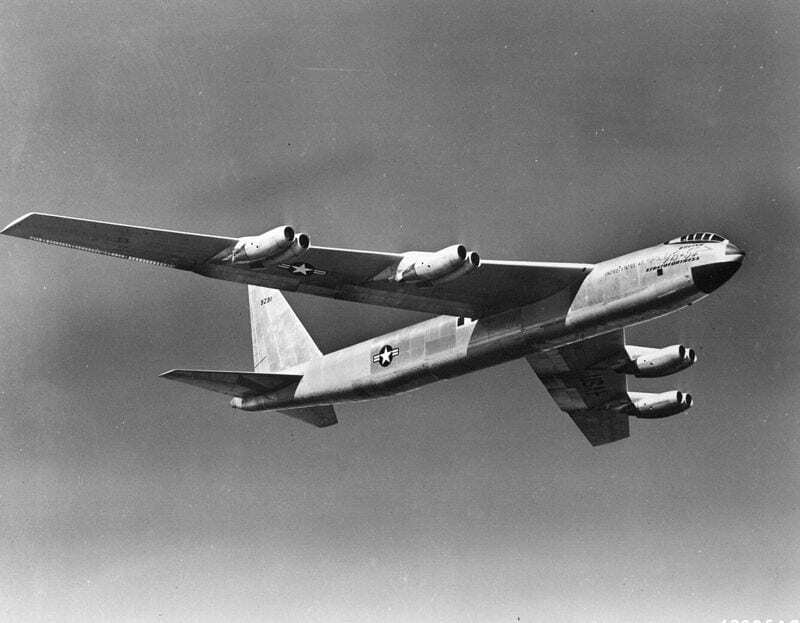 B-52Bs and RB-52Bs were eventually modified to B-52C standard, in addition to 35 new B-52Cs introduced from March 1956. These retained reconnaissance capability but not an “R” prefix. 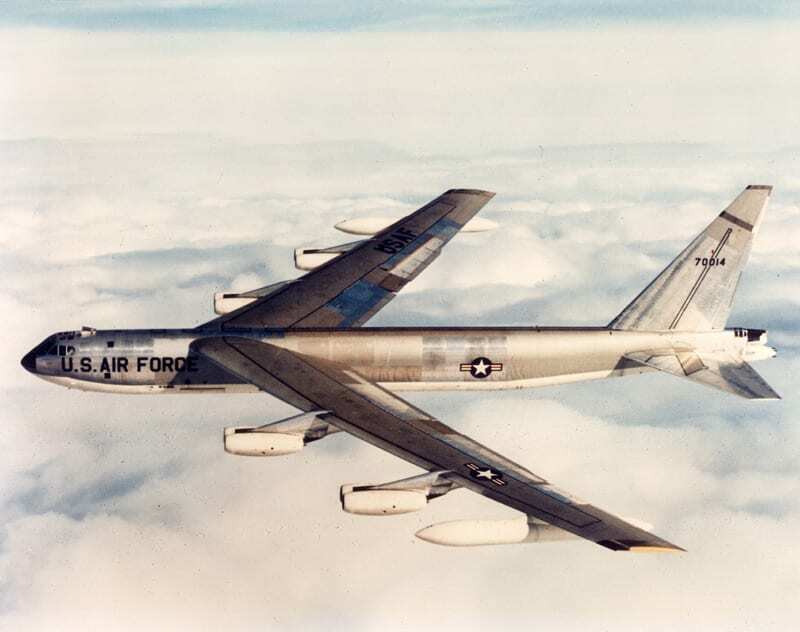 The B-52D was first flown May 14, 1956. One hundred seventy were built. One hundred B-52Es and 89 B-52Fs followed, beginning in February 1959.